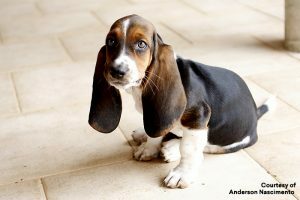 If you’ve ever seen a Hush Puppies shoe commercial, you are familiar with the Bassett Hound. 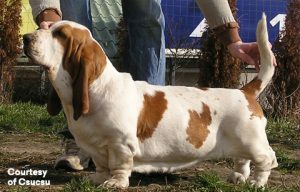 This breed is one of six French Basset-type breeds. This short-legged scent hound originated in the sixteenth century. 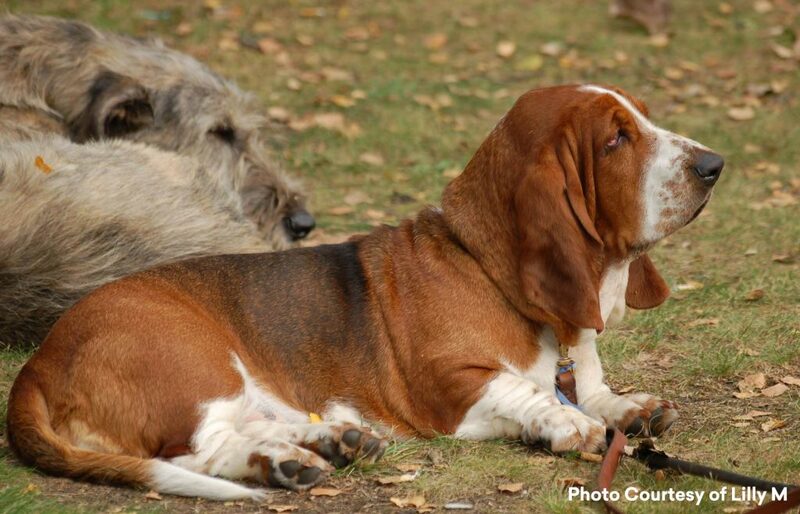 Bred to hunt, Basset Hounds were used to drive small prey from dense areas into the open terrain for hunters. To this day, hunters continue to use Basset Hounds for pack hunting in Europe. These lovely dogs are friendly, outgoing and playful, though not overly active. They have a mild and agreeable temperament that allows them to get along with children and other dogs. They can be vocal and somewhat stubborn but respond well to firm and patient training. As a matter of fact, Basset Hounds have been known to participate in conformation shows, field trials, hunt tests, obedience trials, rally, agility trials, and tracking. Basset Hound males weigh between 51 and 64 pounds, while females weigh 44 to 60 pounds. Both males and females should be no taller than fifteen inches at the withers. They are a heavy-boned breed and well-equipped to follow trails through challenging terrains. Basset Hounds hold their nose close to the ground so as to pick up scents more efficiently. Their short and smooth coat, comes in many colors: black and white; black, brown and white; black, tan and white; black, white and brown; black, white and tan; brown, black and white; lemon and white; mahogany and white; red and white; red and white; black and brown; black, red and white; blue and white; blue, tan and white; brown and white; tan and white; white and lemon; white and red; white, black and brown; and white, black and red. There’s basically a color combination for every taste. According to the Basset Hound Club of America, Basset Hounds are calm, good-natured, affectionate, sensitive and stubborn. Due to their high pack mentality, they do not do well when left alone for long periods of time. As with most scent hounds, the Basset Hound’s nose can get him into dangerous situations. He may follow a scent straight into the path of an oncoming vehicle. The best outdoor setting for an off-leash Basset Hound is a secured, fenced-in area. The two main health issues of concern in this breed are thrombopathia and glaucoma. Joint issues, lymphoma, hemangiosarcoma, and gastric-dilation/volvulus are also of concern in this breed. Life expectancy is about 11 years, though it is recorded that one Basset Hound in the United Kingdom lived to 16.7 years. 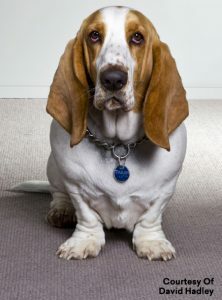 For more information on the affectionate and loyal Basset Hound, go to The Basset Hound Club of America.